"She endeavors to transpose her environment into a visual link between past and present, being constantly aware of color, design and texture." Her background in abstract design using a multitude of media forms, including fiber; has developed into her unique style of painting. The use of ink resist gives her paintings a batik appearance. Her acrylic paintings are sometimes embellished with real beads and other objects. In recent years she has been drawn to the Southwest and the Western culture. She has traveled extensively and her works also reflect cultures from around the world, especially native and ethnic cultures including their adornment and architecture. She is a professional framer and feels the framing is an intricate part of the art. Her paintings hang in many professional offices and private homes throughout the U.S. and abroad. She has shown widely, winning many awards for her art work. She holds a B.A. degree in Art Ed. from U.S.C. Jewelry and weaving are also included in her many creative outlets. 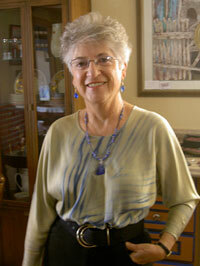 She has shown in many galleries and exhibits throughout Colorado and New Mexico including Taos and Santa Fe. Magadlina's paintings, jewelry and weavings can be seen at the Arati Artists Gallery as well as the Steel City Art Works in Pueblo, CO.